BRAND NEW SHOW FOR 2012! Tom Goodliffe, the self-proclaimed big, friendly nerd, is back with a brand new show all about time. But just what is time? It’s a question that has puzzled the world’s foremost thinkers…Einstein, Newton, Galileo, Plato, Aristotle… and now Goodliffe! In this smart, silly, somewhat science-y stand-up show, Tom fuses facts and funnies, covering everything from the 10,000 year clock to the 10 minute freeview. Tom will take you on a whistlestop tour through physics, evolution, human nature, timekeeping and cleaning out the fridge. It’s fifty minutes about the stuff life is made of. 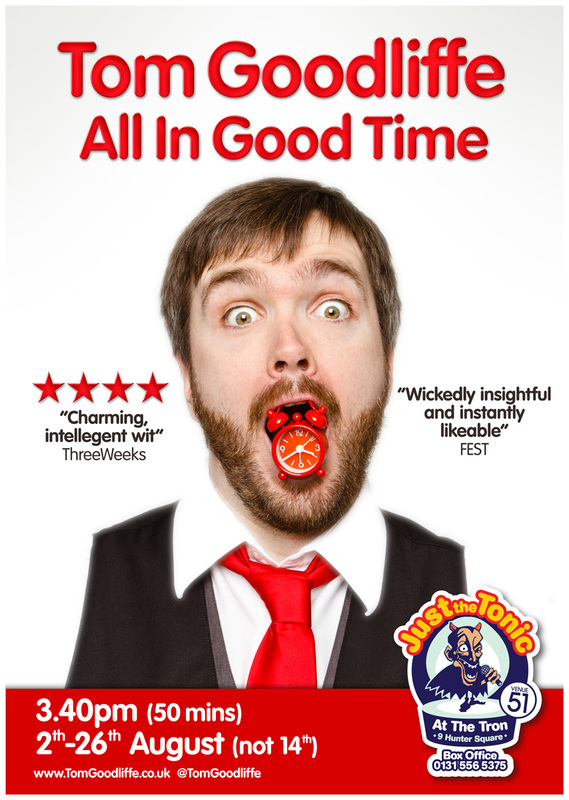 Tickets available from the fringe box office here, on +44 (0)131 226 0000 or in person. OR through Just The Tonic online or in person at their box office at The Caves. There will be cash only ticket sales on the door every day too! Click here for an interview I did with a nice man at The Skinny.